This is a classic creation of Houston-born Richard Linklater who co-wrote and directed “Last Flag Flying” set in December 2003. Quick: how many Oscars has Linklater won? Answer: None. But, he has been nominated five times; three noms for “Boyhood” (2014) alone which was filmed primarily in the San Marcos area. You will like this film if you are patriotic and like great acting. Ok, I know that covers everyone, but Linklater picked a cast of “characters” that fit his script perfectly which means there was a good script and the actors performed marvelously. The movie opens with Larry “Doc” Shepard (Steve Carell) going into a bar to reunite with one of his old buddies (Bryan Cranston) who served with him in the Vietnam War. Those two then locate the third member (Laurence Fishburne) of the group in the pulpit of a small church. The Reverend Richard Mueller (Fishburne) walks with a cane as a result of his war injury, but he no longer drinks and swears; unlike his raunchy reputation duly earned in Vietnam. Sal the barkeep (Cranston) and drinker of many drinks that begins before lunch and the preacher unite their efforts to support their old friend, Doc, of 30 years in his quest to bury his son who was killed in action. The US military, through the actions of a hard-nose Colonel, wants to dictate to Doc on how and when he can bury his son and initially will not surrender custody of the casket. These three old war buddies do not like to be told what to do and they are willing to push back to help a grieving father who happens to be their brother in arms from a war in a vastly different era than today’s by-the-book military establishment of Iraq and Afghanistan. Steve Carell as Doc is the sad, quiet parent who is only trying to do the right thing by loving and honoring his son. But, he’s not 100% sure how to do that. Sal, the one who thinks most clearly when he’s about half drunk, is the person least changed from their days in Vietnam and is the magic piece of the trio to help them think out-of-the-box. Reverend Mueller is the opposite of Sal and is the perfect balancing act to Cranston’s big mouth and beer breath. And it is very clear that they love and respect each other. 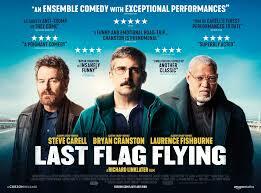 The portrayal of these characters by Carell, Cranston, and Fishburne is a thing of beauty. Stunning performances. I almost let this flick slip by me, but I’m so glad I had the privilege to watch Linklater do his thing again. Someday he will win the gold. Rock ‘n Roll.